It's Birchbox time! The theme is "March Madness." Kind of a stretch and if I just judged it by the contents of the box it would seem like your typical "Spring" box. To see what's in my box and my first impressions, click to read more! I had seen several of these products in the Sneak Peek video and Facebook posts. I am happy I got some of the products I was hoping to get. Like the Evologie Blemish Serum and the Whish Shaving Cream. Both of those products I tested out right away! Whish Shave Crave Shaving Cream | The texture and results of the Whish Shaving Cream were amazing. It was definitely a smooth shave. I also liked that it is paraben free, sulfate free, organic, and not tested on animals. The blueberry scent is "exclusive" to Birchbox. I would actually be more interested in the other scents. It smells good but very candy-flavouring/artificial blueberry which isn't my favourite. I love the design of the packaging very simple and cute. Though the sample size seems pretty decent, it takes a lot of product to make a good foam. The 22mL size won't get you many uses, but I wouldn't say you need more than any other shaving cream. Evologie Intensive Blemish Serum | I was so glad that I received this sample. I have been trying to change my skin care routine to be free of parabens, sulfates, and other chemicals, but was having a hard time figuring out what to replace my acne-fighting products with. I love the ingredients that they list as well as what ingredients they don't. Keep in mind I have only been using it a couple of days, but the serum hasn't been drying. The smell is strong, as in you can tell it has active ingredients, but they aren't "chemical" like. Also though the sample size initially looks small, you only need a small amount per use. Benefit Cosmetics Stay Don't Stray | I haven't tried out this eye area primer and am debating using it (since Benefit Cosmetics tests on animals). In the past, I have enjoyed many products by Benefit and still continue to hear great things about their products. As for a sample size, I think it will last several uses and is a good addition to the box. I know I personally use an eyeshadow primer & face primer everyday! Madewell for Birchbox Emery Board | This is a floral printed on one side, pastel pink on the reverse traditional emery board. Not much to say about it. It's cute. I am glad that it was considered an extra since it doesn't really add too much "value" to the box. twistband Headband | I admit that I hated the lace-printed twistband I received in a previous Birchbox. It lost it's stretch so quickly and looked quite dingy. This headband though seems a little better, perhaps the metallic fabric is more resistant? It looks cute, and I think I will actually get some use out of it. Though I think that these should count as "beauty extras" rather than a sample. 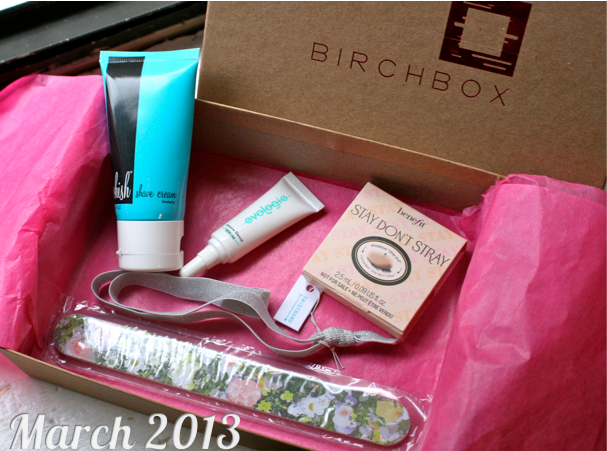 So that's my first impressions of my March Birchbox! I am definitely considering purchasing the full-size of the Whish shaving cream and Evologie Blemish Serum. I hope you enjoy your March BB! Let me know what you got this month!